The Key Account Managers Awards Ceremony: (from left to right) Manuel Dangel, Ulrich Bohl, Anna Axelsson and Thomas Schneege. On 28 March 2019 eight sales representatives and the managing director Bertram Göb from W.AG Funktion + Design gathered to meet at the annual conference. In addition to analyzing current revenues, a strategy for the future was also topic of discussions. Mr. Göb organized a workshop for the new W.AG key account managers, who recently joined the team within the last few months, to practice customer consulting and project management techniques. The sales professionals were able to share their know-how and advise the new colleagues on how they could increase the quality of their consulting methods for prospective clients and current customers. 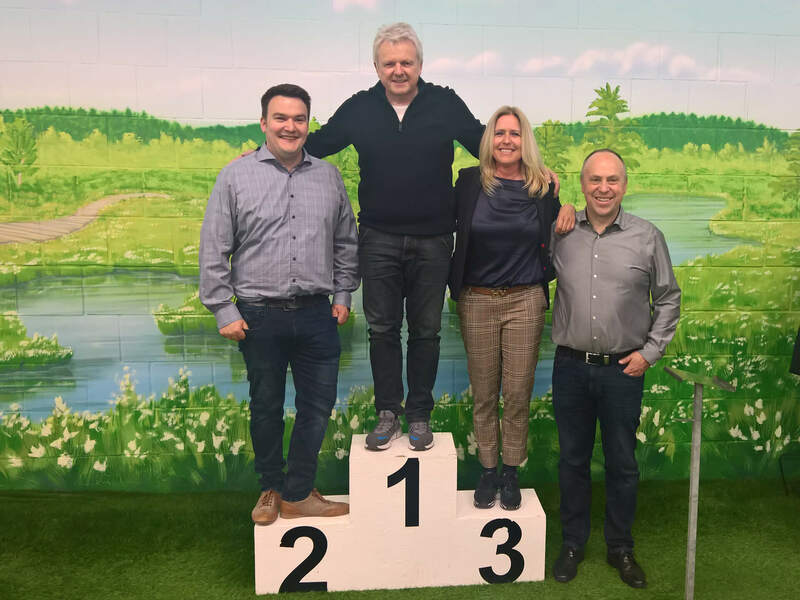 After the meeting, the sales team was equipped with golf clubs and asked to “overcome tricky obstacles” at the Rhön Räuber mini-golf-course Park in Wendershausen. The adventurous mini golf-course displays famous Rhön locations, such as the Wasserkuppe, for example. Each sales representative had the opportunity to demonstrate their golfing-skills. One could hardly speak of practice swings towards the end of the game, where it came to a stand-off between Manuel Dangel and Ulrich Bohl. The senior key account manager Ulrich Bohl was subsequently able to achieve a decisive victory. Anna Axelsson and Thomas Schneege were each awarded third place. The golf champions rounded off their eventful day at the restaurant “Zur Post” in Obernüst where they enjoyed casual conversations in a relaxed atmosphere.